The sky fell down in one lump around sunset, leaving a clear backdrop for the shiny Petronas Towers and neighbouring buildings. 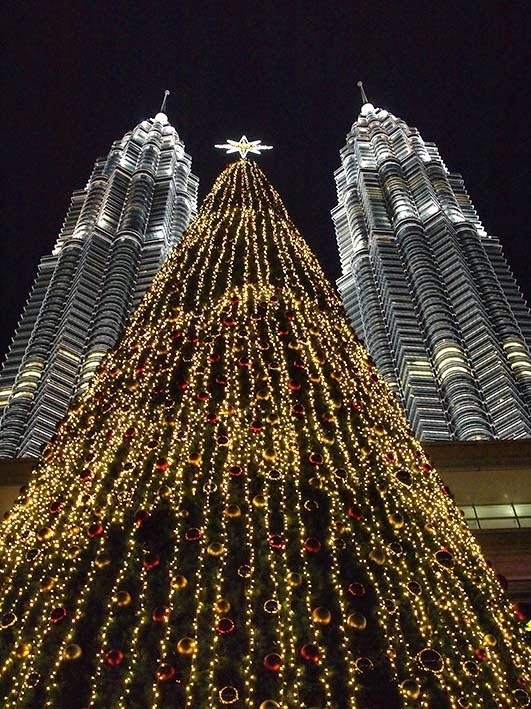 In front of the back entrance of the Suria KLCC mall sat an enormous Christmas tree which twinkled beneath the towers, occasionally in competition with the coloured water fountains on Lake Symphony that danced to music throughout the night. After a rather splendid bibimbap in a Korean restaurant, I strolled back to the hotel, past a few homeless people settling down for the night on the footbridge across Jalan Ampang. One chap had hung his smalls to dry with lumps of concrete on the railings, which did not seem very safe to me. As his other belongings were incredibly well organised, I surmised that he was probably aware of the health and safety aspects of his laundry practices.